Storm has taken their proven high performance 4 ball roller and upgraded the materials to achieve prestige and durability. 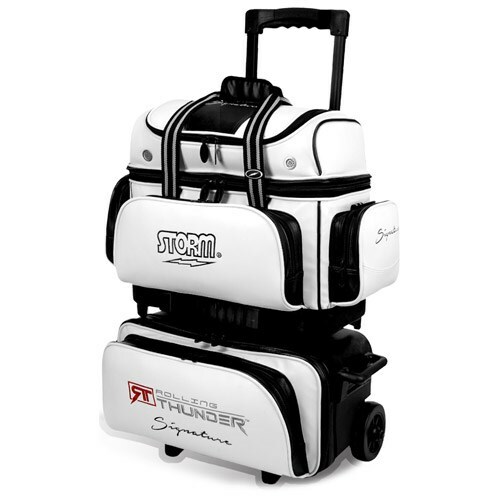 The Storm Rolling Thunder 4 Ball Roller Signature bag holds nothing back in the style department. This bag has all the high tech features of the Rolling Thunder bags but Storm takes it up a notch in the materials used for this signature bag. I just recieved my bag and it came 2 days after my purchase I was very impressed it was rap very neatly and in very good condition the bag has plenty of space and the material is great. This bag looks expensive and feels expensive I love this bag. Great jobs doing and thanks to bowling.com for the fastest delivery. It will be the 1680D Fabric. The weight will be around 12-15 pounds. Unfortunately, this can only be made with 5" wheels. Is there enough room on the handle to add the Storm 1 ball spare kit? It would be a tight fit but you could use a Joey bag instead. what is 1680D Fabric, is it a better fabric then used in most bowling bags ? Hello! The higher the number on the fabric means the better the fabric is and is more durable. Can I just buy the top part of the bag?? Unfortunately, the top part of the bag is not sold separately. Does it come in another color. Hi how do I buy a replacement bag black attachment mine came loose and lost it. Does this bag separate to make travel easier? Yes, the top will come apart from the bottom. Due to the time it takes to produce the Storm Rolling Thunder 4 Ball Roller Signature Black/White ball it will ship in immediately. We cannot ship this ball outside the United States.